Dear sirs, it is unfortunate that your product is reporting mine as being "unsafe". and see that the files are reported as "a variant of Win32/Server-Web.HFS.A potentially unsafe application"
my software is called HFS and is a web server, the original one not a variant, and it's perfectly safe. I would appreciate to be informed on the reasons that led you to mark it as "unsafe". Status: Scan finished. 2/19 scanners reported malware. @Rejetto: Oh, don't worry, like Mars said, those false positive are just a minority. Just thinking loud: maybe if you "sign" your .exe, all the Antivirus false positive could be gone, since "they" would know for sure that's "your release" and not a "variant" released by someone else. Normally this is not free, but searching on Google "Signing EXE files for free", I did get this, this, and this info. strange, in your scans bitdefender is not reporting risks. sourceforge claims is using it. i don't think "variant" is the key word here, just some security tools stating that HFS is "risky" stuff, and i don't see why. It's neither about the scripting capability, as it was introduced in 2.3 and this story started before it. most "high business end company" like defended / macfee / norton / karspaky will flag a program due to the fact of its ability to open a socket and run a server. in this case, bit defend saw that it was opening a web server for http, there a rule in the programs virus search definitions to detect that, and so the program was flaged. I guess antivirus companies are not very friendly with open source programs. And they see every server as a potential risk, and even more if it's open source, since anyone can build your own copy. If you can sign your .exe easily, go ahead, since you will gain the trust from Antivirus companies, and they can't come with that 'variant' excuse anymore. But like I've said, I don't see the point to be worried for just 2 or 3 false positives. do you mean they flag every bloody server out there? the false positives worry me when it's a very common antivirus doing it. They mainly automate his antivirus engines, so, IMHO if you digitally sign your .exe, they can easily add permanently an exception on your program (since they will check your signature in future versions, and if it match yours, they can be sure it's safe). If they find an 'unsigned' exe, they can safely mark it as 'variant'. It has logic, since it adds trust. I think the signature is important for them (especially on open source apps). Ask them if signing the program will change things or not. > More info on how to digitally sign executables, here, here, here & here. The hard part is to find a free certificate authority (CA) that issues code signing certificates (most of them are only for SSL/TLS server authentication). Certum.eu has Open Source Code Signing for €14. I really don't know if it's worth all the trouble of digitally signing the program, but the decision is yours. Well, it was just an idea. If digitally signing doesn't change things, then, I think there is nothing that can be done to change this situation. My suggestion is don't start 'playing their game' (about 'fear'). If they want to say HFS is a virus, then is a virus for them. For the users, having access to the source code and disabling or adding an exception is enough (at least for me). WARNING: All the text written here is a parody of life. Any similarity with reality is purely coincidental. "I've lost my trust on antivirus long time ago. 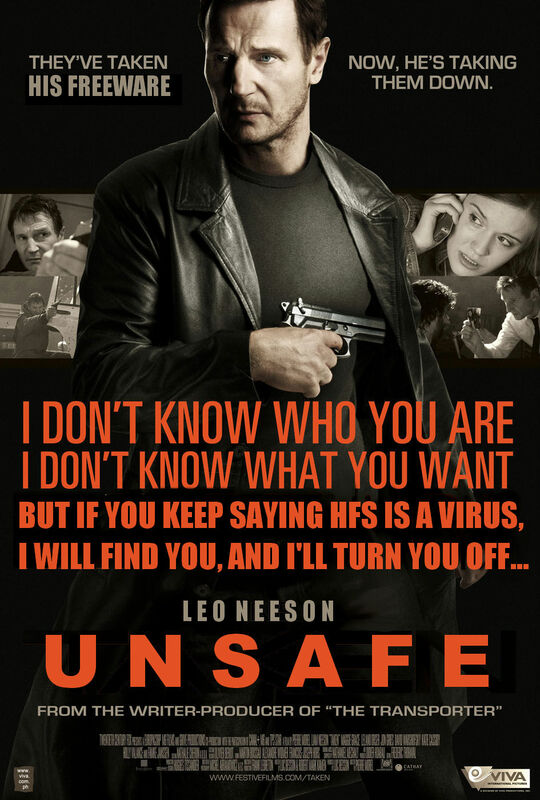 And I'm 100% sure if HFS had a good backdoor from 'you know who', then it will be clean for every antivirus out there. Look Win10, it's a spyware in all of his glory, and you will not find a single antivirus saying "your system is infected", right after being installed. Antivirus are out there for profit, and not always to protect your computer. It piss me off all this situation. There are three kind of things I hate in the computer industry: hackers, antivirus, and virus makers (life would be a dream without all them). If you start playing the game with any of them, you'll loose for sure. I'm glad ReactOS is coming for saving us all (at least they are trying). And if ReactOS fails, then is Linux." LOL, that surely was the problem! Thanks for the info, so Digital Signing is useless for this problem. - Antivirus companies cause a big headache to small developers. - An open letter for Antiviral software companies. 14€ (+tax) /year would be ok, but it takes time. i will consider it when i have some time. I am seeing this also with Windows 10 defender and Malwarebytes.